The day started with a visit to the Cairo Museum. I was shocked. This crammed, almost shabby (but I say this in an affectionate way) little museum guards some of the greatest wonders of all time. I didn't stick to the group, as I had already studied what Umeyma was explaining: I was way too busy filling my memory and sketchbook with pictures. I couldn't get enough, and every piece called to me. I was awed for instance by the diorite statue of Chephren (at left). This stone is impossibly hard. How was it carved so finely? How could it be carved at all? It has never been explained, nor has any other civilization attempted the feat. One detail, apart from the wonderful smiling expression of stout Chephren, arouses my enthusisasm: the falcon standing behind his head, wings stretched on both sides of it. 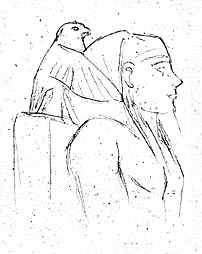 This representation of Horus was meant to protect the Pharaoh, and it truly did: When, at the end of the Old Kingdom, the people rebelled against the government, the priests feared that during the wave of destruction of kingly images they would damage the image of the god as well. They hid the statue in a pit of the temple where it originally stood, on the plateau of Giza under the pyramid of Chephren. There it was found, intact, thousands of years later. Many people wonder why Egyptian art looks the way it does: 4000 years and they couldn't improve to the level of say the Greek? The answer is, the Egyptians never meant their art to be pure aesthetics. It is the way it is because it packs a great deal of information. The distortions inflicted to the human body (head and legs from side view, torso in frontal view, front leg longer so that both feet rest on the base line) are designed to be the most explicit possible. Egyptian art is a two-dimensional informative tool that works according to a pre-established formula. Volumes could be written on what every detail (shape, size, colour...) means in a fresco. It would be wrong to think that it made the art rigid and dull. The Egyptians were, as they still are now, a happy, light-hearted people that valued laughter. They were in love with word games and puns. Humoristic scenes abound, such as this one where a shepherd doesn't notice that someone is milking his goats behind his back. Or the apes stealing fruit under the nose of the tree-owner. They even have a mock story of the battle between Horus and Set, where we can see the two gods suing each other in court and resorting to every dirty trick in the book. Artists had a limited palette of pigments, which they could mix at will, but they usually preferred to use the pure, bold colours of which little is left. The colours would have resisted time, if it weren't for the desert winds (facades), the smoke of narguiles when Arabs took camp in the temples (ceilings), and thousands of curious hands when tourism started (walls). The craftsmen used calcite for white, copper oxyde for green, lapis or turquoise powder (later heated copper) for blue, heated iron for red, and coal for black. Egg yolk was applied to maintain the colours fresh. None of the exhibited pieces (save one, to which I will return later) were as compelling to me as the lonely colossus of Akhenaton in the small room dedicated to his reign. The contents of this room are almost all that remains from him and his. 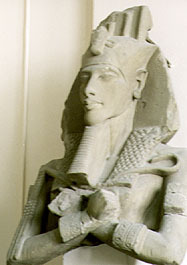 The colossus gives Akhenaton strange features, in the Amarna tradition of caricature. Do not think this is the way he really looked -- it's a misconception rising from the belief that all his representations agree on his looks. But there exists a more realistic portrait that shows him as a fine, mature-faced young man. Across the room from Akhenaton, as if the museum personnel had meant the two to be able to gaze at each other for eternity, is the bust of Nefertiti. It is not the famous crowned portrait which is located in Germany, but a lesser-know, less advanced and softer one. The head is shaped much like the head of today's Playmobil toys, prepared to be fitted with a crown. Nefertiti means "Behold! the beautiful woman is coming" or "Beautiful among the beautiful". It is not a widely known fact that Tutankhamon was a close parent to Akhenaton and Nefertiti -- perhaps a younger half-brother of the Pharaoh. The gods of Egypt have spectacularly set the balance right by making this little family, the memory of which suffered deliberate and thorough obliteration under the orders of Horemheb, one of the most famous in Antiquity. I have evoked already the fantastic discovery of the tomb of Tutankhamon. Its contents was kept, in its entirety, in the Cairo Museum, and we have French Egyptologist Auguste Mariette to thank for preventing it from being split and distributed all over Europe. It takes several rooms to exhibit it fully. 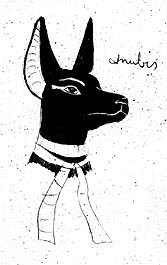 I particularly fell in love with the proud statue of Anubis, carved in wood and painted black with gold sheet. I found there a pair of sandals with black and white soles: these two colours represent the enemies of Egypt, the Lybians and African tribes, and by wearing these the pharaoh would symbolically be treading upon them. This is also the reason why enemies were often painted on the floor. There are also walking sticks with handles sculpted as Lybians et al, in such a way that holding these staves smothers them. Given the lifespan of the Egyptian civilization (4000 years that we know of, and a lot more than we can guess at), we can muse upon the efficiency of this kind of sympathetic magic! Art under the reign of Akhenaton and Nefertiti had been characterized by its human side and its love of showing the private life of the royal couple, playing with their children or sitting together. One scene shows Nefertiti, then 15, being bounced on the knees of her royal husband of 16. This touch did not vanish immediately with their disappearance, it is still visible in scenes from the tomb of Tutankhamon. A famous article illustrating this is his throne, where his wife Ankhsenamon can be seen applying perfume to his body. If one looks closer at the throne, however, one will notice that the two of them share a single pair of sandals. This always gives me goosebumps. Now for the other compelling piece of work I hinted at earlier. As I entered the main room of the child-king's treasury, luck was with me. The mass of other visitors had just left it. I was alone in front of the Mask. For over 10 real minutes, I was able to admire its perfection with no interruptions, under every angle. It is impossible to tire of it. It is really too perfect. 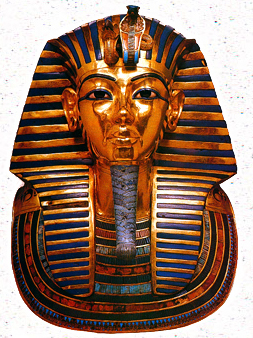 We are used to seeing it flattened in pictures, but to have it in front of one's eyes, with the gold glittering as it should and the deep blue bands managing to look like immortal fabric, and above all, Tutankhamon's face smiling with shiny eyes as if his soul had projected into the inert metal to make it alive... It is not a smile, it is almost a grin. It is, at any rate, the expression of a happy 18-year-old who is not trying to look older than he is -- the Egyptians valued their youth and kept it alive. Eyeliner, such as is beautifully clear on the mask, was a protection against the sun and illnesses of the eyes as much as it was an aesthetic practice. Even now, in the Egyptian countryside, it is applied to newborns a few days after birth. I think the blue color serves against the evil eye, as well. After the Museum, we returned to our bus to have lunch in a restaurant on the outskirts of the city. As I was gazing at the landscape on the left, I suddenly saw... a pyramid. What on earth?? I expected the famous monuments to be at some distance in the desert, so having them rise on the side of the road this way was a shock. 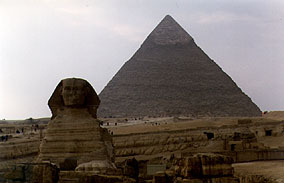 The fact is, the urbanization is so intense that within a few years the pyramids will be in the middle of the city. An appalling fact. No matter how much you're prepared for them, the Pyramids remain deeply impressive. One needs to move around the plateau to get the full impact of their mass, precisely because they're so huge. Entering them is also a good idea. 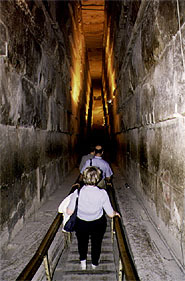 I was lucky, because the pyramid currently open for visit was Khufu's, the largest of them all. I don't think any other monument has been the source of so much fantasies as this one, especially in regards to its construction. Every few years or so, someone claims they have solved the mystery of how it was built, but all these theories present weaknesses, often unresolvable, and the veil has yet to be lifted. This has been said before, but I wish to insist on it: these massive blocks of granite are fitted so snugly that one cannot slip a credit card between them. This is impossible to do today despite all our technology. The men who worked on these construction sites were not slaves, but paid workers, and they invented strikes, so forget about the popular notion of thousands of men working to death. The same goes with the myth that the walls of the Great Pyramid are carved with mysterious inscriptions and curses. If there was ever a naked monument, it is this one. The only thing it contained was an empty sarcophagus that may never even have been used. I braved the climb with a few others up the single corridor inside the construction (there goes as well the silly notion that pyramids are mazes. I'd get lost in my own house much more easily). 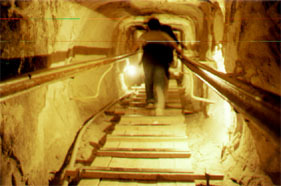 It can get difficult as people are coming down at the same time, and as you can see most of it is not particularly wide. The Great Gallery, however, is not only large but impressive (here we were heading back down). It seems it was deemed more proper to have such a hallway right before the king's chamber. We reached the room and found what was left of the coffin. Its heavy cover was never found: another mystery. The room hasn't changed in eons -- even the crack on the ceiling, apparently, was contemporary with the building. At the foot of the Pyramids is a small museum built around the delicate solar bark found in that very spot. It is 42 meters long and mostly built in cedar wood, with some sycomore, but also, surprise, some types of wood that are found today in India and South America. Hmmm again. The Sphinx is as unavoidable as the Pyramids, and its image just as misused. It is quite small but fascinating. 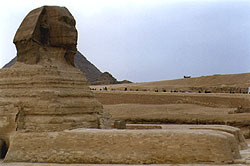 The Sphinx was known to the Egyptians as Heru-Khuti: Horus of the Horizon, and was given his own face by Pharaoh Menkara (owner of the third pyramid of Giza). It is much, much older though, predynastic to be exact. It used to bear the pharaonic fake beard, but the latter, found in two pieces in the sand between its feet, is now in the British and Cairo Museums. As for the nose, it was the victims of the Mamluks or maybe the Arabs who used it for target practice -- for Muslim of the austere Fatimid period, this giant head issuing from the sand must have been utterly blasphemous. 2. The heart is finely sliced. 3. It is hammered on a piece of wood, to crush the fibers, then flattened with a roller. That gives flexibility. 4. They are dipped in water for a few days. 5. The slices are disposed on a water-absorbing fabric (such as cotton), in a weaving pattern: one layer of horizontal slices, then one of vertical slices, etc. 6. The whole thing is put under pressure for 6 days, with the cotton changed every day.